Oh hi there, happy Friday! With Halloween on the way, I thought today’s super-quick craft was fitting. 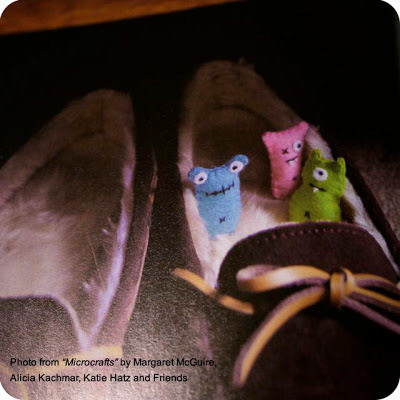 It was inspired by the teensy monster babies in Microcrafts, the book I reviewed in Wednesday’s post. The original monster babies in the photo below are made of embroidered felt. Using Holly Keller‘s monster baby concept, I cobbled together a little finger-puppet from teeny bits of construction paper and a plastic milk carton seal. My little one is unusually terrified of any and all odd-looking characters. I thought that maybe these tiny and extremely benign monster finger-puppets might be a good way to re-introduce him to monsters, and ever so gently work away at that fear. As you can see, this craft is the definition of simple. 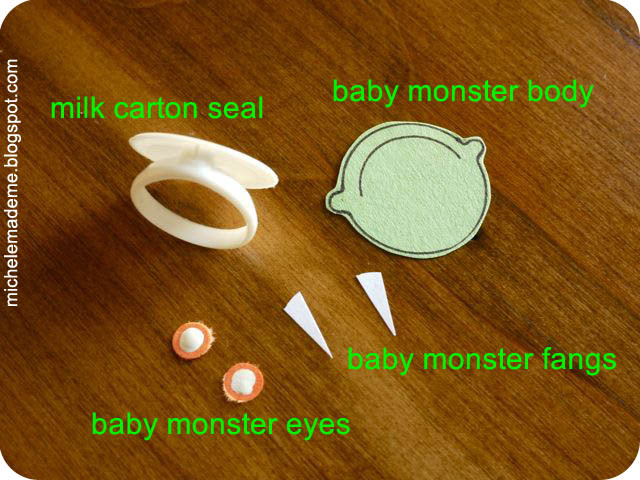 Make a monster baby the size of the plastic milk carton seal from a few scraps of construction paper. Flip the plastic seal inside out. 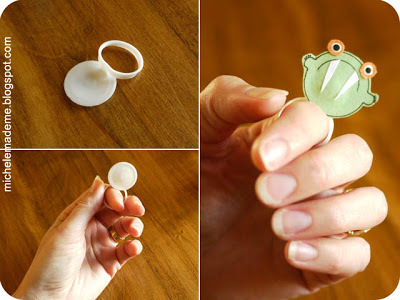 Glue the little guy onto the seal. 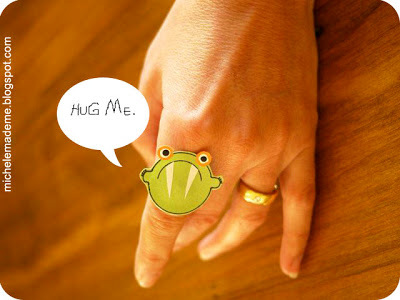 You now have a diminutive monster finger-puppet! Alternatively, if you leave the seal in its original position, you have yourself a monster baby ring. And his friends seem to pop up out of nowhere. That’s what monsters do I guess. Though, they are extremely polite. Surprisingly! No… But thank you very much for asking. Have fun dreaming up all kinds of monster baby finger-puppet play with your kids! Have a fabulous weekend. And to my fellow Canadians: “Happy Thanksgiving!” I’ll see you Monday! My son would go crazy for these! Very cute (I like your versions best). They are adorable. Hi Michele, super cute monsters! Love them. Love this idea! They would look so cute popping up here and there in our Halloween display! I love them!!! How did it go: the introduction of these babies to your monster-shy boy? I hope he fell in love. 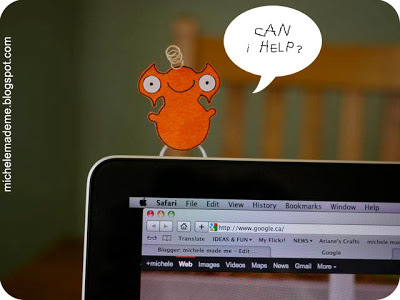 And I must say, your cartooning skills are fabulous, Michele – these are just way cute! 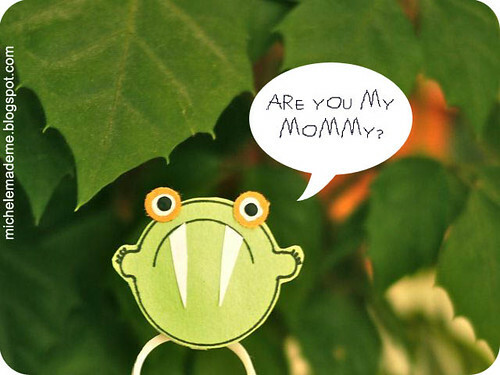 love these cute little monsters-great recycling project. 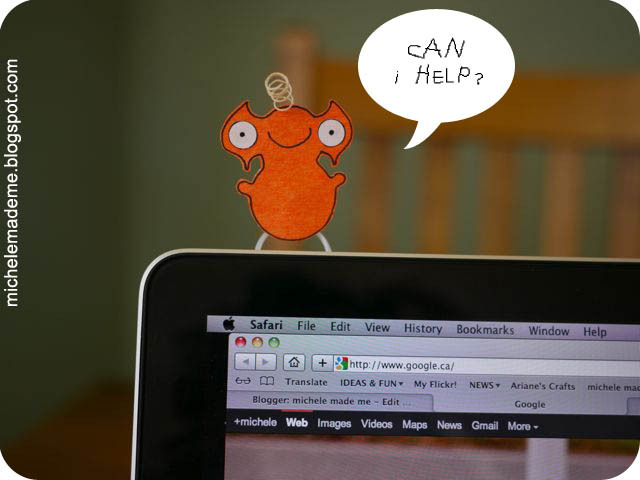 the little red guy can totally help me!